It was a project so much was expected of: Alfa Romeo competing at Indianapolis and in the CART series, a second European constructor with a pedigree in racing competing in the USA, Porsche being the other. A project with a history in itself before it eventually began. It almost appeared as if it was taken up as the first alternative that met no serious opposition from anyone who had something to say about what Alfa Romeo was permitted to do in racing. It had a number of false starts and eventually failed to produce much of importance for anybody involved to be proud of. In the space of two and a half seasons, five different types of cars were used, all using the Alfa Romeo CART V8 engines. No doubt the most remarkable one of this quintet was the third one. This was also the car that debuted an Alfa Romeo engine at the Indianapolis Motor Speedway for the first time in four decades. Part 11: Exhaust solutions a 'waste' of effort? During the period when this series was constructed a few discoveries were made about one of the 90CAs in which the 1989 89CA chassis were involved. These needed further investigation. We then had the fortune to get in touch with Johnny Capels, the team owner running the Alfa Romeo-powered cars in 1989. His cooperation yielded such a wealth of information that we decided to update what initially were intended as introductory chapters leading up to the 90CA. This information was simply too good to ignore and enabled us to pay closer attention to this period of the Alfa CART adventure. In addition, more relevant data about the Ferrari CART project became available, some of this info proving several facts wrong that were already published in the chapter about this project. It is therefore that some of the chapters appear as extended, revised versions. I am much obliged to some of the men who somehow have been part of the Alfa CART project. My sincerest thanks go to Johnny Capels for his priceless input, which enabled me to give more attention to the rarest of all the March CART types, the 89CEs. Also special thanks to Scott Roembke (USA) and Larry Faust (USA), Patrick Racing team members, for supplying valuable inside information. 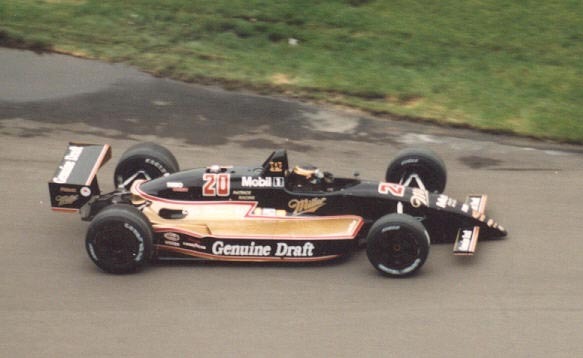 Also thanks to Bobby Rahal for providing some of the facts mentioned in the chapter about the Ferrari CART project. My thanks also go to car collector Chuck Haines for his assistance with the localisation of the remaining hardware. Then, my sincere thanks to Duncan Rollo for narrating a first draft of this project. I owe special thanks to Arjan de Roos for providing massive assistance with this project by supplying a number of pictures used on this site. Besides that, Arjan’s knowledge about the CART Ferrari project made him a more than welcome co-author of the chapter about this prelude to the Alfa CART project, a task he happily took up. Also many thanks to Brian Brown, David Ayers and John Darlington for supplying additional pictures, and to Roy Caruthers for connecting me with Johnny Capels. Also many thanks to René Joosten for making available DVD recordings of the ABC TV coverage of the qualifying weekends that I missed, and to Martin van der Hulst for supplying pictures of the March 88C-009 muletta. Special thanks to Petra Kienast (Germany) and Andy Gilberg (USA) and the Marchives website for all kinds of assistance provided. Finally, a big thanks to 8W chief editor Mattijs Diepraam for allowing me to tell the story about this disastrous adventure and all the editing he did for it. Annuals focusing on the 500 miles race, valuable sources of info and likeable books. Annuals devoted to the CART seasons. A bit superficial and not too detailed and sometimes containing totally off-topic items. Best example: possibly a sponsored item, but why does this book have to devote no less than four pages to GMC's Bonneville World Speed record attempt for trucks? Given the short time March lived on after the release of this book, this is one of those books - as good as it is - you wished was published a bit later in order for the story to be complete. Overview about rally cars used at world championship level. Consulted given the 88C influence on the 89CE, nice picture book for anyone who was at Indy during the Month of May 1988. Column by Doug Nye within this magazine, about the Alfa Romeo Indycar project. The periodical of the Dutch Alfa Romeo owners, I contributed the article which inspired this entire piece. Weekly magazine, one of the leading magazines worldwide for international racing, comprehensive attention given to Indianapolis and CART racing. Fortnightly Dutch publication, occasionally some attention given to CART racing. The notebook version that was made available in the Media Center to press members on the morning of 27 May 1990, before the start of the race. Later on, an internet version of the race report became available as well. Press kit released during May 1990. Indianapolis 500 Media Fact Book, 1989 and 1990. Media guides published by the Indianapolis Motor Speedway and made available to members of the press. DVD registrations of ABC's TV coverage of qualifying. You would be surprised to know what kind of read-between-the-lines info can be retrieved from all the comments made by the commentators. I also made use of the Alfa Corse press kit released in 1989, of which I found contents on the Internet. For the introductionary chapter about the Ferrari CART project the authors used the following additional publications. Consulted to obtain info about the turbocharged Ferrari V8 engine used in the Gp. C Lancias raced from 1983 until 1988. Racing Lancias Giancarlo Reggiani Giorgio Nada Editione, Vimodrone, Italy, (2001) Consulted to obtain info about the turbocharged Ferrari V8 engine used in the Gp. C Lancias raced from 1983 till 1988. A book published by Ferrari giving an overview and a glimpse in the archive of what made Ferrari great: developing racing engines. One of the several autobiographies Ferrari wrote, that makes one better understand Ferrari's past actions and decisions. Recollections of Franco Gozzi, for many years Ferrari's personal secretary and closely involved in all racing activities. The longest running magazine on Ferrari with a fine section called Corse. The colorful weekly Italian magazine on racing. An attempt to list all known Ferraris by chassis numbers.